Uncover the top 8 sales tactics to meet your sales quota and improve your sales process. Empowered by SifData. 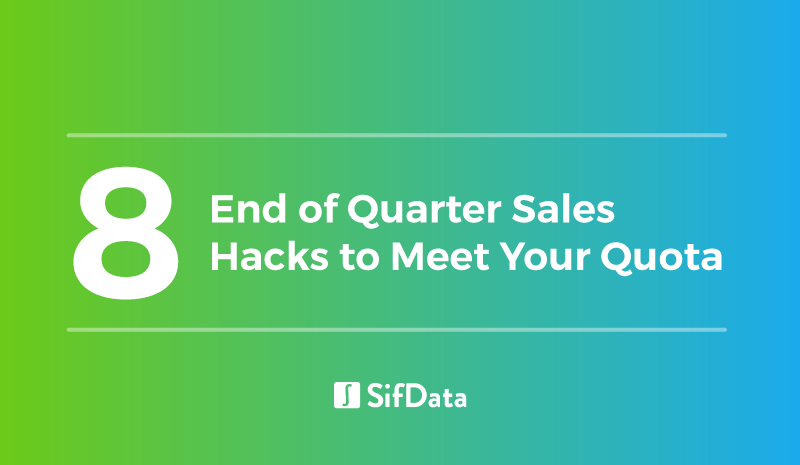 It’s the end of the quarter, and the pressure is on to meet your sales quota. You want to make the most of every minute in your sales process, not just because a deadline is a deadline, but because you’ve worked hard and are already so close to meeting your revenue goals. We know this feeling all too well, so we’ve come up with a list of our favorite hacks to help you meet (or exceed!) your sales quota for the quarter. We know a warm lead is much more likely to convert than a cold one. Where do you find these quickly? A well proven hack is to find out if your current customers have changed jobs. They are already familiar with your product and company and want to make a good impression in their new role. A great sales tactic to add to the playbook - use SifData to get a monthly report on your contacts who switched jobs and start contacting. See your conversation rate soar and revenue with it. Your company will thank you for the new logos. It’s the end of the quarter, and you’re working long hours to try and achieve your quota. However, you need to keep things in perspective because you are not going to meet your quota overnight. It may seem overwhelming, but you can make the task more manageable by breaking down your quota into daily goals. For example, you can look at your conversion rates over time and gain a good idea on how many conversations it will take for you to meet your quota. Based on your conversion rate, set a conversation goal for each day. Then, look at how many calls and emails, on average, it takes to connect with a prospect. You may need to ask your manager to help you come up with this number. Once you have that number, tell yourself that you will make X amount of phone calls and send Y amount of emails each day. Your activity goals may be higher than normal because it’s the end of the quarter, but do not lie to yourself and set outrageous goals. Take your most promising, but non-responsive leads, and look at the call logs. If you call those leads around the same time every day, set a task to call them at a different time. You may find a better time to reach them. Try getting to work a little earlier and give them a call then. You may catch them before their day gets busy, and they will have more time to listen to you. If you have been calling your prospect for a while, they have probably flagged your number as a sales call. If you have access to another phone or number, try calling them from that line. If your contact number connects you with a gatekeeper, they probably recognize your voice and send you directly to the prospect’s voicemail. Ask your coworker to speak with the gatekeeper and have them hand the phone back to you if they get through. You can return the favor by calling one of your coworker’s leads. Sometimes, personalization is the key to getting an email response. Your prospect may ignore countless templated emails, but a personalized email might finally get them to respond. Do your research and take time to write them a personalized note. Go on their LinkedIn, google them, check their company’s blog, and see if you can find anything relevant to reference in your email. If they recently switched jobs (you can use SifData to generate a report on job changes) start off your email by congratulating them on the new role. Blockers are people who have actively said "no" or chosen a competitor. 30% of the blockers in Salesforce today have moved on to new roles. Their replacements are likely new in the role and looking to make changes. You can run a report with SifData to find blockers and then reach out to their replacements. Set aside a few hours at the end of the day and go through your old leads. When you spoke with these leads in the past, the time might not have been right for them to become a customer. However, things change. They might have changed jobs, and you can use SifData to generate a report to see which leads have recently changed companies. Even if they haven’t switched roles, it never hurts to give them a call or send them an email to check in with them. There’s a great chance that your sales manager has been in your shoes before, and they can provide some insight on what you can do to make a final push to meet your quota. If you are feeling rusty or your confidence is down, ask your sales manager to do some cold-calling roleplay with you. If your company records sales calls, pick a few of yours and send them to your sales manager. You could be making simple mistakes on your calls that led to them being unsuccessful. By having an extra set of ears listen to your calls, you may be able to make a simple change to meet your quota. This hack should be obvious, but you shouldn’t be reaching out to west coast leads at the same time that you are calling east coast leads. Organize your leads by time zone, and then create a list for each location. Once you have your lists built, schedule a call blitz for each one. A call blitz is a scheduled period of time where you do nothing but call your list of leads. This will you get in a rhythm and put you in the right state of mind when you finally get your lead on the phone. See how SifData can make a positive impact on your sales teams, today. Date- Nov. 19, 2018, 12:52 a.m.
SifData tracks contact movement in their CRM to help companies keep tabs on their leads and contacts. Perfecting your sales pitch and becoming a better SDR means understanding your prospect’s mindset, what they want, and how you can help them accomplish their goals. Polish up your team’s lead management workflow by addressing these 3 common misconceptions.